In the late 19th and early 20th centuries George Jr., Mary, and William Vaux regularly visited the Canadian Rocky Mountains. These expeditions, starting from their home in Philadelphia, included first ascents, studies of glacier recession, and a brilliant collection of some of the earliest images of glaciers of the Canadian Rocky Mountains. 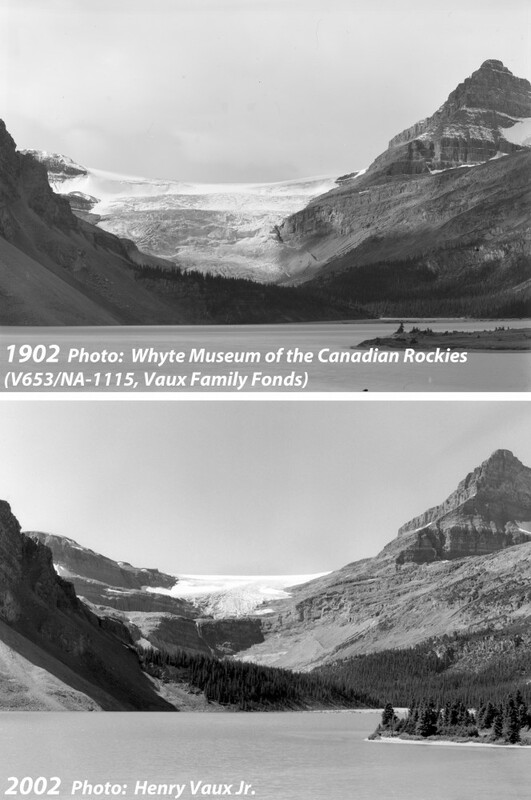 Beginning in 1997, Henry Vaux Jr. has taken repeat photographs of the glaciers his grandfather and great aunt and uncle imaged a century before. Standing in the same location with his own tripod and camera, Henry Vaux Jr. has documented a century of change. It is a great privilege to showcase four of Henry’s repeat photographs at GlacierChange.org! Thank you, Vaux Family! Look for Henry’s book (“Legacy in Time”) in late-2012/early-2013. 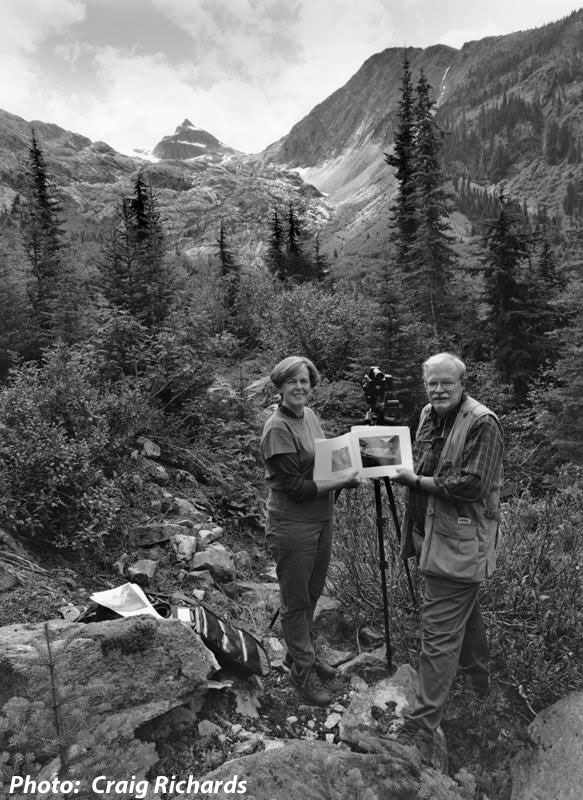 Henry Vaux Jr. and sister Missy Vaux photograph Illecillewaet Glacier in 2002. In their hands they hold the image taken by their grandfather and great aunt and uncle (George Jr., Mary and William Vaux) in 1902. This photo is used here with the permission of Craig Richards. Thank you, Craig! Illecillewaet Glacier, British Columbia, in Glacier National Park of Canada. The present-day terminus is just outside of sight in the 2002 photo. 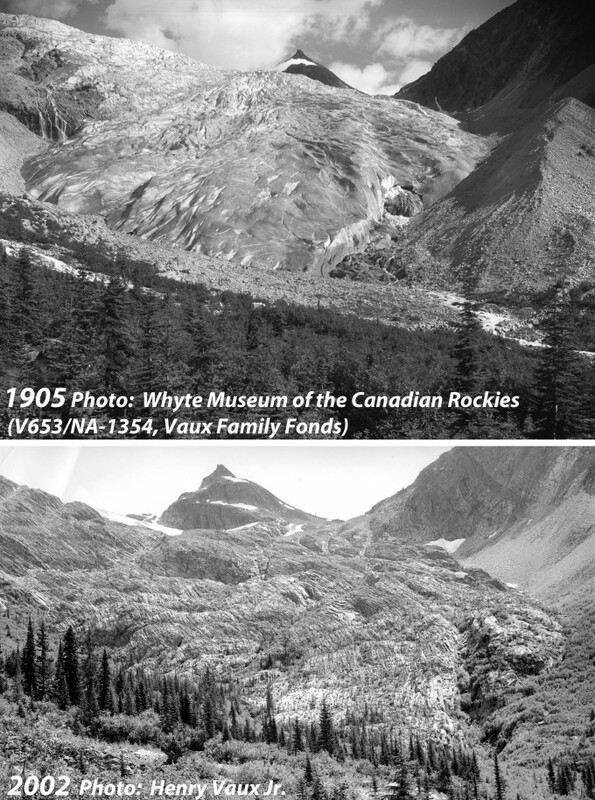 The 1905 photograph is used here with the permission of the Whyte Museum of the Canadian Rockies. The 2002 photograph is used here with the permission of Henry Vaux Jr. Bow Glacier, Alberta, in Banff National Park. This vantage point is nearly on the shoulder of the present day Icefields Parkway, near the Num-Ti-Jah Lodge. The 1902 photograph is used here with the permission of the Whyte Museum of the Canadian Rockies. 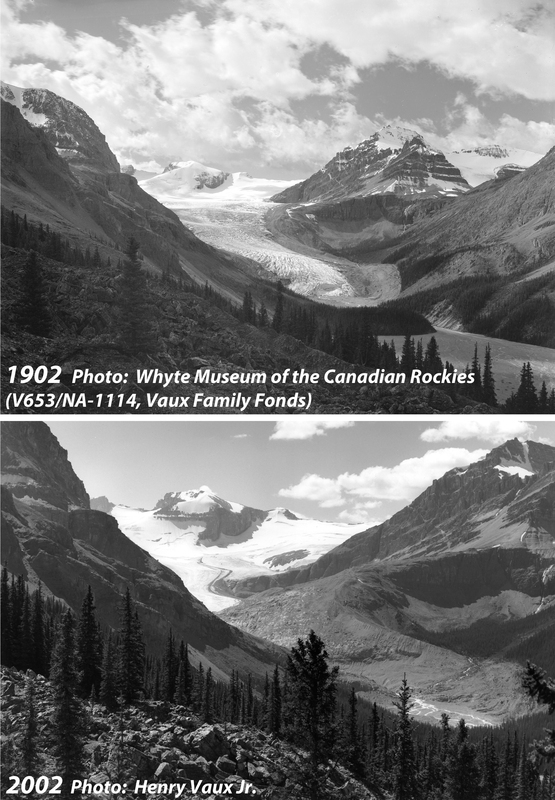 The 2002 photograph is used here with the permission of Henry Vaux Jr.
Crowfoot Glacier, Alberta, in Banff National Park. Crowfoot Glacier is readily viewed from the Icefields Parkway, about 30 kilometers northwest of Lake Louise. The two prominent glacier tongues (present in 1902), which inspired early explorers to name it Crowfoot, have nearly completely disappeared. The 1902 photograph is used here with the permission of the Whyte Museum of the Canadian Rockies. The 2002 photograph is used here with the permission of Henry Vaux Jr.
Peyto Glacier, Alberta, in Banff National Park. The view of Peyto Glacier from near the present-day Bow Summit viewing platform. See additional Peyto-Glacier content at GlacierChange.org. 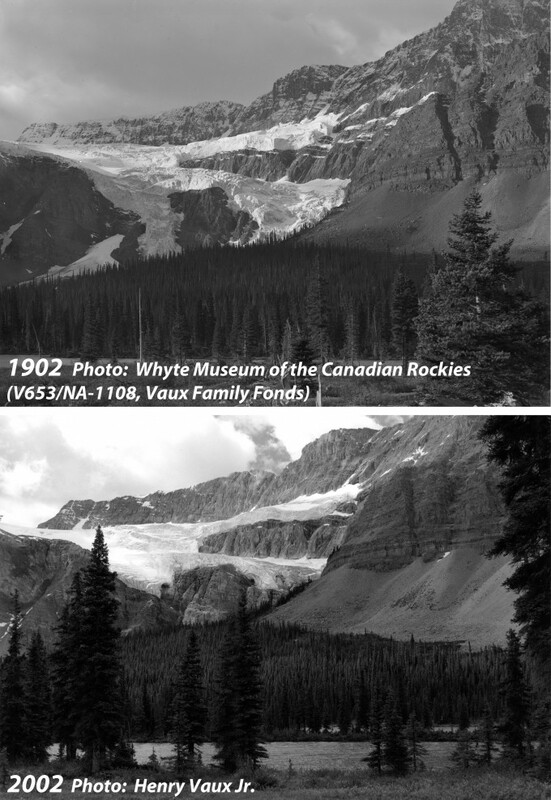 The 1902 photograph is used here with the permission of the Whyte Museum of the Canadian Rockies. The 2002 photograph is used here with the permission of Henry Vaux Jr.